Emilie Pouget’s research is aimed at understanding some of the basic principles of molecular organic self-assemblies and hybrid organic/inorganic structures formation in order to develop new nanofabrication strategies to control the morphologies from the nanometric scale to the macroscopic level.She is particularly interested into the chiral self-assemblies and their inorganic transcription, forming chiral colloid suspensions. In the Chiral Molecular Assembly group, Emilie Pouget is responsible of the hybrid organic/inorganic works and developped new strategies to organize these individual nanoobjects into hierarchical structures in 2 or 3 dimensions in order to enhance the properties in specific directions and create objects that cana be manipulated at the macroscale. Emilie Pouget studied the chemistry at the Polytechnic National Institute of Toulouse (INP Toulouse, France) where she specialized in Materials science and obtained her degree in 2002. She got a second Master degree in Materials Science at the University of Bordeaux in 2003. In 2006, she obtained her PhD from the University of Rennes for her work on the mineralization of peptidic self-assembled nanotubes under the supervision of Dr. Franck Artzner. This work is described in the PhD thesis: "Nanotubes de silice obtenus par biominéralisation d’un auto-assemblage peptidique : structure et mécanismes de formation". From 2006 to 2008, Emilie Pouget went to the Eindhoven University of Technology (Netherlands) to work as a post-doc in the Biomineralization group supervised by Nico Sommerdijk. She specialized into the kinetic studies of biomineralization by coupling the cryoTEM tomography and the electron diffraction. She then worked one year in collaboration with the Centre de Recherche Paul Pascal in Bordeaux (France) in the Forschungzentrum in Jülich (Germany) studying a biological liquid crystal. In 2009, Emilie Pouget got an award to study the mineralization of this biological liquid crystal. Since January 2012, she is working as researcher at the CNRS, in the CBMN Institute (Chimie et Biologie des Membranes et des Nanoobjets) in Bordeaux, France. 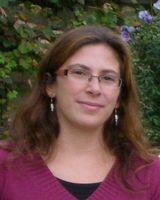 She is involved in most of the project studied in the Chiral Molecular Assemblies’ group. - R. Oda, E. Pouget, T. Buffeteau, S. Nlate, “Molecular Technology” 2017, Ed. Wiley. Chapter: “A Tale of chirality transfer, multi-step chirality transfer from molecules to molecular assemblies, organic to inorganic materials, then to functional materials”. - Duval, D.; Tarabout, C.; Huby, N.; Artzner, F.; Gaviot, E.; Zyss, J.; Renault, A.; Pouget, E.; Beche, B. In Integrated Optics: Devices, Materials, and Technologies Xiii; Broquin, J. E., Greiner, C. M., Eds. 2009; Vol. 7218.